The ancient Mayan empire flourished in Belize for almost 3000 years, until around 900 AD, and left one of the world’s richest cultural and archaeological legacies. Their grand cities and splendid temples are scattered throughout most of the country, only a handful having been excavated and open for visitors to explore. Considered to be the most spectacular in all of Belize and one of the most powerful cities in the entire Mayan world, Caracol stretches over 70 sq miles and is set in rich jungle terrain in the Mountain Pine Ridge in Cayo, at 1,650 feet above sea level. The 140 foot centre piece Caana (‘Sky Place’) is the tallest structure in Belize and supports an impressive four palace structures and three temples – climb to the top and witness one of the most breathtaking views in all of the country. 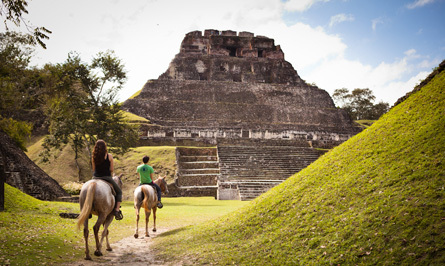 Lamanai is Belize’s longest occupied Mayan site, where signs of occupation span from 1500 BC to AD 1700. Of the fifty or so Mayan structures, the most impressive is the stepped temple, built into the hillside overlooking the New River Lagoon, which is said to be the largest pre-Classical structure in Belize. The best way to approach the ruins is by boat, a 90 minute trip from Orange Walk Town. The journey passes through some of the most beautiful jungle in northern Belize, with great opportunities for wildlife spotting, plus seeing the Mennonite community of Shipyard, before reaching Lamanai. Xunantunich is reached by a hand-cranked ferry across the Mopan river off the Benque road. Whilst the site is smaller in comparison to the mighty Caracol or Tikal, the complex of temples and plazas are no less impressive, with the dominant El Castillo central shrine rising to 130ft. It is believed to have been occupied as early as 1000BC but was little more than a village, the large architecture seen today was built around the 7th century AD when it rose in power. On the outskirts of San Ignacio in Cayo, Cahal Pech is believed to be the oldest known Mayan site in the Belize River valley, with first signs of settlement dating back to almost 1500BC. Most of what remains today is dated back to AD 600-800, when its farming population was believed to be around 10,000. It is a quiet, shady and less frequented site and boasts a decent visitor center detailing the history of the site. Ranked as one of the most impressive of all Mayan sites and widely considered to be one of the wonders of the ancient world, Tikal is hard to rival, which is why it is one of the most popular tourist attractions in all of Central America. Although home to Mayan communities from around 600BC, Tikal only rose to serious power around AD 300. It was under King Jaguar Paw in the middle of the 4th century that Tikal became the dominant kingdom in the region. It is believed that by AD 500 the city covered more than 11 square miles and had a population close to 100,000. We recommend a sunrise tour, departing around 4am. It’s an unforgettable experience to watch the sun rise behind the mighty temples and listen whilst the jungle awakens.